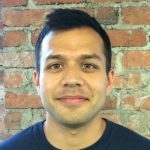 Vivek Ahuja is a 2008 USNA Graduate, Nuclear Submarine veteran, and UC-Berkeley Haas MBA Alum. While at UC-Berkeley he interned at The North Face and served as the VP-Admissions for the Haas Veterans Club, where he individually assisted dozens of transitioning veterans in developing their MBA applications. While at Haas and after graduation he co-founded and grew a payments company in Indonesia called Xendit. He currently works in the Risk team at Affirm, a growing FinTech startup in San Francisco.